Annalee Doll Description: Last one. 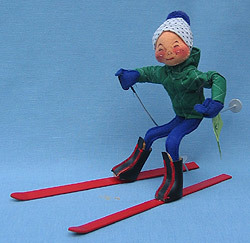 Closed eyes, closed mouth, white and green polka dot knit hat with green pom, green quilted jacket, blue mittens and pants, black boots, red skis, holds aluminum ski poles. Tag dated '88.